We’d love your help. Let us know what’s wrong with this preview of Hockey Abstract 2013 by Rob Vollman. To ask other readers questions about Hockey Abstract 2013, please sign up. Good introductory book on hockey statistics - I'll probably have to reread it a few times for the concepts to stick. 7/17/2014: This time I took a few notes - hopefully that helps me remember some of the key points. Rob Vollman is an author, speaker, consultant, and long-time pioneer in the field of hockey analytics. His popular innovations have helped win Stanley Cups and Gold medals, and have shaped the way that teams are built, and the game is covered. A former member of the Professional Hockey Writers Association, Rob was first published in the Fall 2001 issue of the Hockey Research Journal. He has since c Rob Vollman is an author, speaker, consultant, and long-time pioneer in the field of hockey analytics. His popular innovations have helped win Stanley Cups and Gold medals, and have shaped the way that teams are built, and the game is covered. A former member of the Professional Hockey Writers Association, Rob was first published in the Fall 2001 issue of the Hockey Research Journal. He has since co-authored all six Hockey Prospectus books, two McKeen's magazines, and has authored five books in his own Bill James-inspired Hockey Abstract series, including the highly popular 2016 book, Stat Shot. 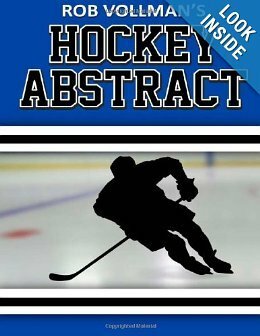 While modern advanced statistical hockey analysis stands on a mountain of complexity, Rob's work is best known for being expressed in clear, focused, and applicable terms, often presented in a humourous and entertaining way. Whether you're arguing about the worst trades in history or which team improved most in the off-season, Rob's objective approach will add clear, cold facts to the discussion in a style that is undeniably engaging—and convincing! Rob's most popular innovations include player usage charts, quality starts and home-plate save percentage for goaltenders, goals versus salary (GVS) to measure a player's cap value, the team luck index, his history-based projection systems, coaching metrics, the setup passes statistic, and advances in the field of NHL translations and league equivalencies (NHLe) to understand how well players coming from other leagues will perform. In 2014, Rob organized a grassroots hockey analytics conference in Calgary as a platform for the field's latest innovations, starting a movement that has since spread to eight other cities, including annual events in Ottawa, Rochester, and Vancouver. Rob's work can be found every week on NHL.com and ESPN Insider, where he has been featured since the 2008-09 season. In all, Rob has written 800 columns for a variety of hockey websites, and has been featured in the Hockey News, the Globe and Mail, the Washington Post, Forbes, and Rolling Stone. Since his first guest appearances on Nashville Predators radio in the summer of 2011 and throughout the subsequent season, Rob has made over 300 appearances on 60 different radio programs, TV shows and podcasts in 20 NHL cities, including most notably NHL Game Day, Hockey Night in Canada radio, Sportsnet's Hockey Central and 2015 Trade Deadline coverage, Boston Bruins NESN television, TSN's That's Hockey, ESPN's Sportscenter and Hockey Today, CBC Radio, and Wharton Business Radio.